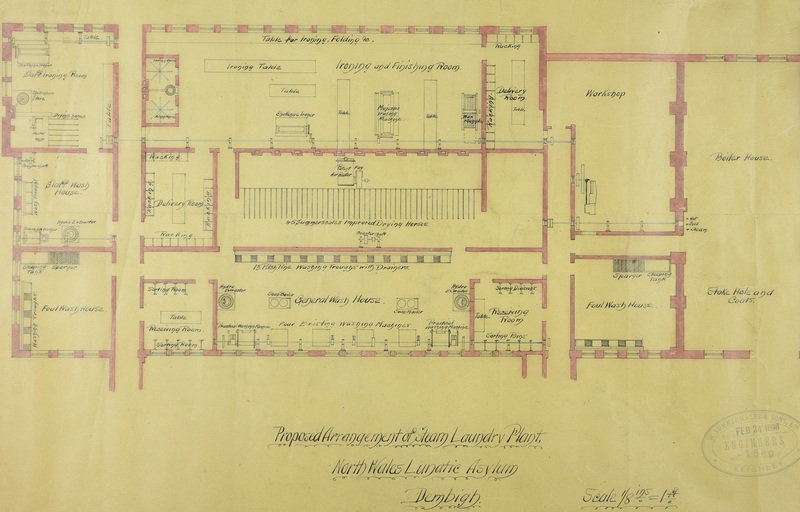 Of all the records in the North Wales Hospital collection, none better demonstrate the development of the hospital than the series of over 200 plans. As part of our Wellcome funded Unlocking the Asylum project these are currently in the process of being catalogued and repackaged. The main hospital site was expanded many times throughout its lifetime, new properties were built and existing ones redeveloped. The plans provide a clear indication of the type of work that was taking place. There are a variety of different types of plans, including building plans, electrical plans, drainage plans, water supply plans, engineering plans, floor plans, and garden plans. In 1844 work began on the building of the hospital. 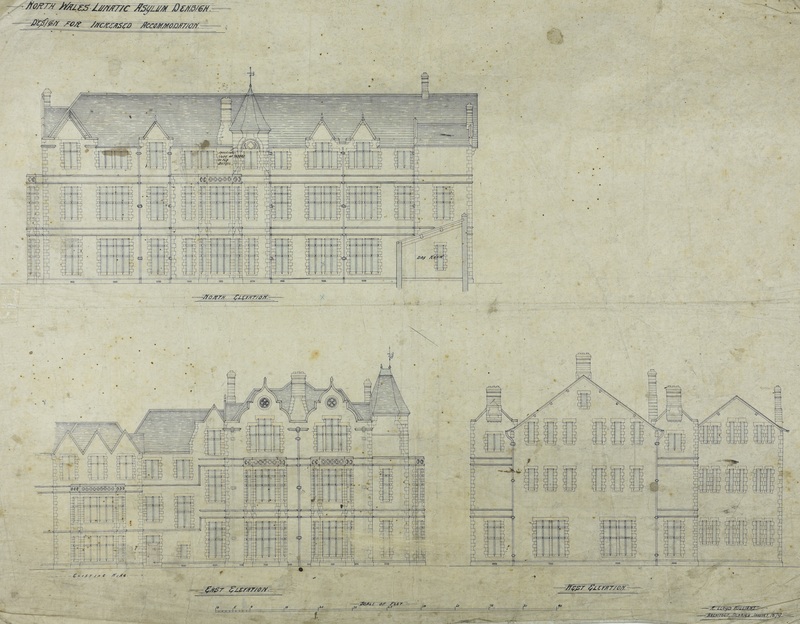 Although none of the original buildings plans have survived, a report by the Architect Thomas Fulljames provides a written account of his plans. By 1876 the hospital had reached full capacity, and it was decided that a new wing to accommodate an additional 130 patients would be built. One of the earliest plans in the collection dating from January 1879, features a proposed design for the exterior of the building during this expansion to patient accommodation. A design for increased accommodation by R. Lloyd Williams Architect, dated 1879. After several smaller expansions proved insufficient to deal with the growing numbers of patients, a large scale scheme of redevelopment was embarked upon in the 1890’s. This included an upgrade to drainage and sanitation, a large accommodation block for female patients, new kitchens, a dining hall, and new washing facilities. One of the plans from this redevelopment shows the proposed arrangement for the steam powered laundry plant, which included separate washing and ironing rooms for staff and patients, and an attached boiler house. Plan of the proposed arrangement for a steam powered laundry plant by W. Summerscales and Sons Limited Engineers, dated 1898. The collection also includes plans of later developments to the main hospital building and other properties, including drainage and electrical plans of Gwynfryn reception hospital in the 1930’s, and building plans and technical drawings of the nurse’s training school, constructed in the late 1960’s. The plans within the North Wales Hospital collection are a unique and important resource. Not only do they provide a history of the development of the hospital, they are also useful for architectural history and a beneficial resource for any potential future development to the former North Wales Hospital building and site. 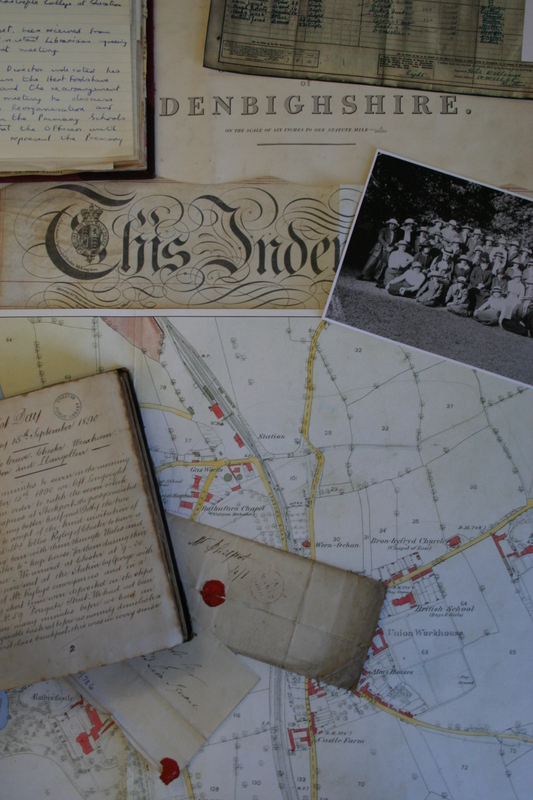 To find out more about the work we are doing to preserve and repackage the plans please see our previous blog post Unlocking the Asylum: Unrolling the Archive here.